The Decatur Park District believes that the arts make invaluable and unique contributions to the educational process and to the enrichment of the lives of all. Marie Jagger-Tayler (Ms. Marie) is the Cultural Arts Manager for the Decatur Park District and a member of Actors Equity Association, Chicago National Association of Dance Masters, and a Certified Dance Educator. She and is also a past member of AFTRA and SAG. Prior to the Decatur Park District, Marie enjoyed being a professional actress/dancer/choreographer and director who performed on Broadway, toured nationally with A Chorus Line, and appeared in countless television commercials, industrials and resident theatre companies. She was a freelance director/choreographer until she met her agrarian husband, Jody, and settled down in rural Macon where they reside with their 3 children. Marie has developed curricula and taught musical theatre and dance in various capacities for the past 30 years. She served as adjunct professor of dance at Millikin University (Decatur, IL) for 8 years and as Director of Education for the Little Theatre on the Square (Sullivan, IL) for 10 years. In this role, she was intimately involved in all aspects of the theatre, including drama/dance instruction, sets/costumes/lighting for performances, and program syllabi for all workshops, sessions, camps and classes. At the Decatur Park District, she has been instrumental in building community interest and involvement in the arts, where she manages all of the Cultural Arts programming. She also served as co-host of the Decatur Park District’s Parks at 5 weekly radio show from 2008 – 2016. Marie was awarded the 2011 Women of Excellence award for her work in the Cultural Arts and the 2013 Jennifer Song Community Spirit Award. 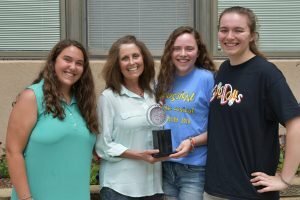 In 2018, she received an Excellence in Theater Education Tony Award Honorable Mention. This honor recognizes a K-12 theater educator who has demonstrated monumental impact on the lives of students and who embodies the highest standards of the profession. Jen Petagno is the Cultural Arts Technical Supervisor, joining the staff in May 2017. Jen is a 2014 Millikin University graduate with a degree in Technical Theatre. At Millikin, her emphasis was in technical direction and scenic painting. While at Millikin, Jen had the opportunity to be the scenic artist for the Department of Agriculture for their State Fair Display and scenic design a production at the Station Theatre. Millikin also gave her the opportunity to be Technical Director over four productions and Paint Charge over four productions. Before becoming the Cultural Arts Technical Supervisor, Jen had worked part time for the Park District in our Cultural Arts programs since the summer of 2013 as a technician, scenic designer, scenic artist, and has helped with many special event and cultural art activities and needs including movies, concerts, and assisting with the technical set up for many of the Park Districts performance programs. Alexis is the Cultural Arts Supervisor, joining the staff in January of 2019. Alexis holds a Bachelor’s of Science Degree in Recreation Management from Illinois State University. While attending Illinois State University, Alexis served as Vice President of Poise Dance Team. She was a member of the team for 4 years and choreographed and taught several routines for their Fall and Spring showcases each year. In her final semester of college, Alexis completed an internship with Bloomington Parks and Recreation working in the administrative offices, planning and implementing several programs, and instructing dance classes. Prior to coming on staff with the Decatur Park District, Alexis worked at Holy Family Parish School in Peoria, IL, as a Dance Teacher and Secretary. She taught pre-school through 8th grades various dance styles, choreographed, and produced the school’s Spring Dance Recital. Alexis currently teaches dance at the Decatur Park District as well as assists in various capacities to ensure quality programming in the Arts. She has always had a passion for arts and teaching, and at the Park District she has the opportunity to pursue both of her passions.